The Starbucks encounter is just another example of the daily difficulties of being black in America. Two black men sitting in a Philadelphia Starbucks were arrested, placed in handcuffs and forcibly removed from the premises after being asked by a Starbucks employee to leave because they hadn’t ordered. In a video that went viral on social media, the two men are surrounded by several Philadelphia police officers. A Starbucks employee called the police because the two men had asked to use the restroom without ordering anything and refused to leave the store when asked to leave. When the police arrived, the two men, who were in no way being disruptive, were again asked to leave. They were then arrested, handcuffed, and forcibly removed. While in police custody, the men were photographed, fingerprinted and held for eight hours, according to their attorney. This is a Starbucks. Since when are people asked to leave a Starbucks who are just sitting there? Before inundating me with knee-jerk responses that the police were simply “doing their job,” can people please acknowledge the blatant racist behavior demonstrated here? Creating a just America (and “Making America Great Again”) means addressing and eradicating ALL forms of injustice–including racism. Justice is not a zero-sum game. 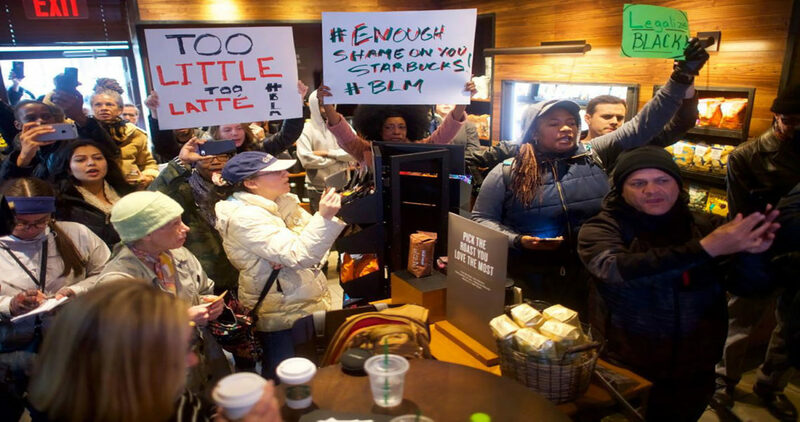 People do not have to get defensive and point to other examples of injustice in America because people are protesting the recent racially motivated incident in a Philadelphia Starbucks. In order to dismantle systemic racism in America, racist behavior has to be acknowledged as such. We have to stop making excuses for racist behavior and acknowledge the pervasiveness of racism in America. It is well past time that we call racism “wrong,” even if it is legal.